George is whiling away some time contemplating a chessboard. He has placed a King in the bottom left square and proposes to transfer it by a sequence of moves to the top right square. A King can, of course, move only one square at a time, either horizontally vertically or diagonally. In order to keep this process finite, however, George has decided to allow only three different moves — one square forward (upward), one square to the right, or one square diagonally up-right. Even with this restriction, there are many ways of transferring the King to the diagonally opposite corner. It could proceed up the left-hand side then across the top. Or along the bottom then up the right-hand side. Or diagonally straight across the middle. Or any one of a myriad of zig-zag routes. George’s attempts to identify all possible routes were witnessed by his small son. Who is right — and exactly how many different routes are there? “You spend a lot of time on all your calls,” observed George. “It sounds as though you were making trunk calls at the peak times,” remarked George. How many three-zorind calls did he make? Enigma 995 was also called “Number please”. We have a word game a bit like Scrabble. Each player is given a selection of letters with which to make words. Each letter of the alphabet is consistently worth a non-zero single-digit number and if you make a word you work out the word-score by adding up the value of the letters in the word. In this way, for example, ELEVEN has a different word-score from TWELVE. In fact if you work out the word-scores of ONE, TWO, THREE, NINE, TEN and THIRTEEN you find that each is equal to that of either ELEVEN or TWELVE. Which of them is (or are) equal to ELEVEN? 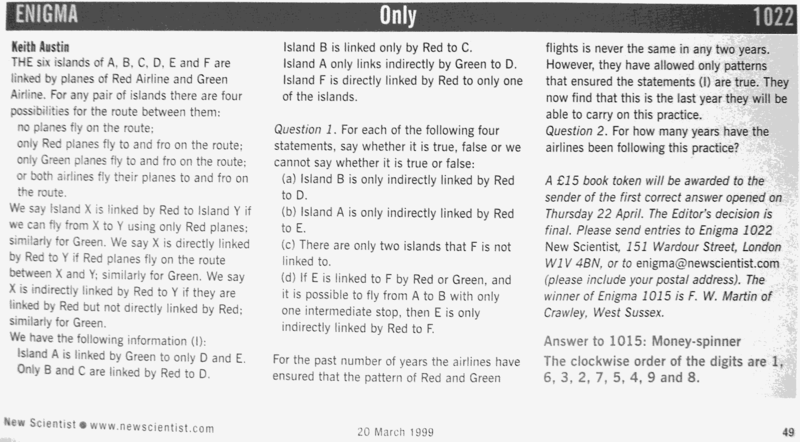 (a) They are not constrained to begin with 0? (b) They are constrained not to begin with 0? 1. A prime which is also a square reversed. The first two digits form a square, and the last two a prime. The 1st, 3rd and 5th digits are all the same. 4. The square root of 7 across. 6. The square root of the reverse of 2 down. 7. A square which is prime when reversed. 1. A prime which is also a square reversed. 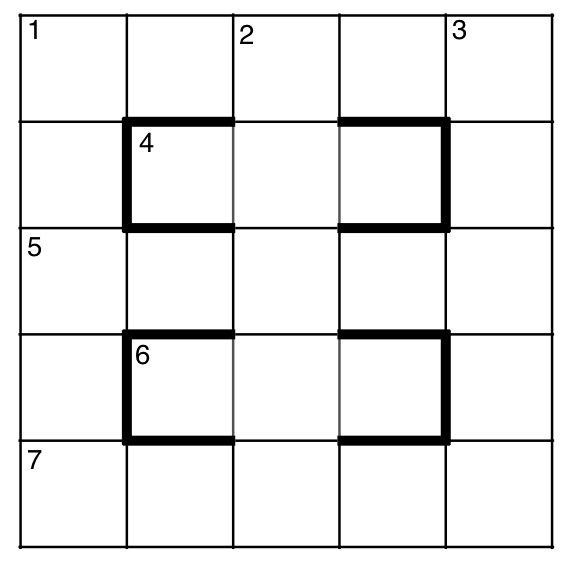 The first three digits form a square which is also a square when reversed. The last two digits form a prime which is also a prime when reversed. 2. A prime which is also a square when reversed. All the digits are different. The first three digits form a square which is also a square when reversed: and the last digit is the same as that of 1 down. 3. A square which is a prime when reversed. Find the answers for 1 across, 1 down, 3 down and 7 across.